As a part of your company’s comprehensive wellness program, you may consider developing and publishing a regular wellness newsletter. This is usually done via email and should go out to your corporation’s staff mailing list. Remember that a good corporate wellness program can help your company decrease sick leave absenteeism and significantly minimize workers comp and health care costs. Education is a key component of a successful wellness program and that’s why so many corporations have begun the practice of publishing a wellness newsletter. 3. Encourage Engagement: While you don’t want to overburden your readers with too many calls to action, you do certainly want to use your newsletter to promote their involvement in the current programs and incentives that you’re offering through your wellness program. Always remind your employees about what’s happening at your company and how they can use those programs and tools to their advantage as they pursue a healthier lifestyle. If planning, writing and publishing a quality wellness newsletter for your corporation sounds like a lot of work, then you may want to look into hiring a wellness company to produce these for you. 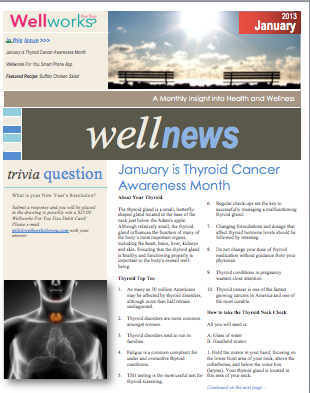 Call Wellworks for You to ask about our wellness newsletter and bulletin program as well as our other services that may be helpful for your company!